mathematically precocious and was appointed to the mathematics faculty of the Royal Artillery School in Turin while still a teenager where he taught students older than himself. Through the efforts of Euler, Lagrange was named a foreign member of the Berlin Academy at the age of 23 and succeeded Euler there at the age of 30 when Euler left Berlin for St. Petersberg in 1766. He went to Paris as a member of the Academy of Science in 1787. He was able to keep his head in the turbulent times to come even as those around him, including his friend the chemist Lavoisier, lost theirs. 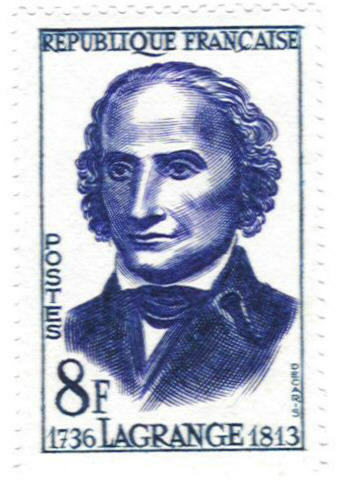 He was on friendly terms with Louis XVI and Marie Antoinette, Tallyrand and Napoleon; Tallyrand appointed him to the commission that created the metric system, and after the purging of Laplace and Lavoisier, Lagrange served as its president. For further information and some related stamps see Metric System . 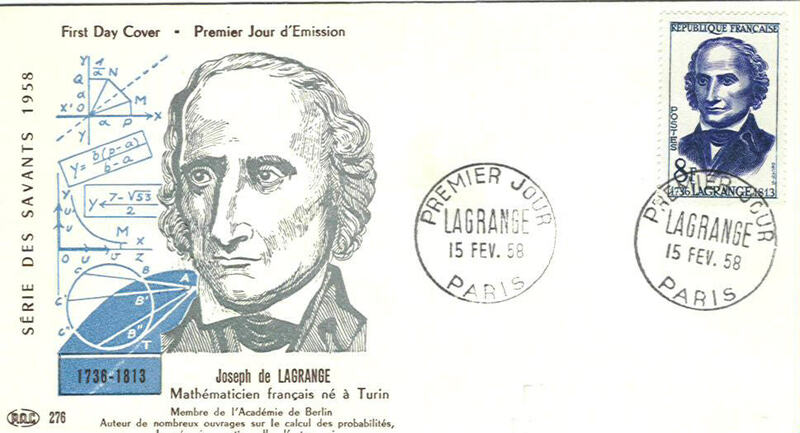 Mathematically, Lagrange was an analyst and not a geometer; he points out in the preface of his Mechanique analytique that `no diagrams will be found in this work'. He did fundamental work, along with Euler, on the calculus of variations, and applied it to mechanics. In addition to analysis he worked in number theory, proving the theorem that every number can be written as the sum of four squares, and the theory of equations; his work on the theory of equations showed the importance of permutations (and hence eventually group theory) and was influential with both Abel and Galois. 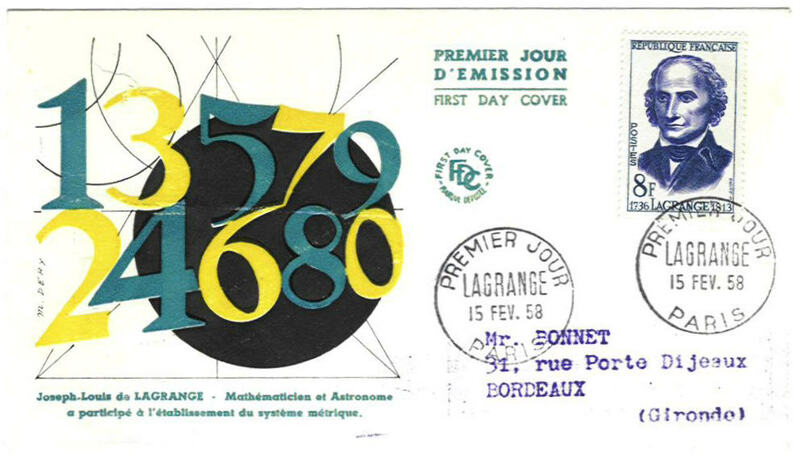 France issued the stamp below in honor of Lagrange in 1958. I also have two first day covers for this stamp.